I've come across the term 'Functor' a few times while reading various articles on functional programming, but the authors typically assume the reader already understands the term. Looking around on the web has provided either excessively technical descriptions (see the Wikipedia article) or incredibly vague descriptions (see the section on Functors at this ocaml-tutorial website). Can someone kindly define the term, explain its use, and perhaps provide an example of how Functors are created and used? Edit: While I am interested in the theory behind the term, I am less interested in the theory than I am in the implementation and practical use of the concept. Edit 2: Looks like there is some cross-terminoligy going on: I'm specifically referring to the Functors of functional programming, not the function objects of C++. The word "functor" comes from category theory, which is a very general, very abstract branch of mathematics. It has been borrowed by designers of functional languages in at least two different ways. In the ML family of languages, a functor is a module that takes one or more other modules as a parameter. It's considered an advanced feature, and most beginning programmers have difficulty with it. Another application of ML functors is layered network protocols. The link is to a really terrific paper by the CMU Fox group; it shows how to use functors to build more complex protocol layers (like TCP) on type of simpler layers (like IP or even directly over Ethernet). Each layer is implemented as a functor that takes as a parameter the layer below it. The structure of the software actually reflects the way people think about the problem, as opposed to the layers existing only in the mind of the programmer. In 1994 when this work was published, it was a big deal. For a wild example of ML functors in action, you could see the paper ML Module Mania, which contains a publishable (i.e., scary) example of functors at work. For a brilliant, clear, pellucid explanation of the ML modules system (with comparisons to other kinds of modules), read the first few pages of Xavier Leroy's brilliant 1994 POPL paper Manifest Types, Modules, and Separate Compilation. The type T is parameterized over another type, which you should think of as the element type of the collection. The type of the full collection is then something like T Int, T String, T Bool, if you are containing integers, strings, or Booleans respectively. If the element type is unknown, it is written as a type parameter a, as in T a. Examples include lists (zero or more elements of type a), the Maybe type (zero or one elements of type a), sets of elements of type a, arrays of elements of type a, all kinds of search trees containing values of type a, and lots of others you can think of. where we now have a small t, which means "any type in the Functor class." To make a long story short, in Haskell a functor is a kind of collection for which if you are given a function on elements, fmap will give you back a function on collections. As you can imagine, this is an idea that can be widely reused, which is why it is blessed as part of Haskell's standard library. As usual, people continue to invent new, useful abstractions, and you may want to look into applicative functors, for which the best reference may be a paper called Applicative Programming with Effects by Conor McBride and Ross Paterson. A functor is a container of type a that, when subjected to a function that maps from a→b, yields a container of type b. Unlike the abstracted-function-pointer use in C++, here the functor is not the function; rather, it's something that behaves consistently when subjected to a function. There are three different meanings, not much related! You can now add quickly many possible orders, ways to form new orders, do a binary or linear search easily over them. Generic programming FTW. In functional programming languages like Haskell, it means some type constructors (parametrized types like lists, sets) that can be "mapped". To be precise, a functor f is equipped with (a -> b) -> (f a -> f b). This has origins in category theory. The Wikipedia article you linked to is this usage. So, this is a special kind of a type constructors, and has little to do with functors in Ocaml! In imperative languages, it is a pointer to function. In OCaml, it's a parameterised module. If you know C++, think of an OCaml functor as a template. C++ only has class templates, and functors work at the module scale. An example of functor is Map.Make; module StringMap = Map.Make (String);; builds a map module that works with String-keyed maps. You couldn't achieve something like StringMap with just polymorphism; you need to make some assumptions on the keys. The String module contains the operations (comparison, etc) on a totally ordered string type, and the functor will link against the operations the String module contains. You could do something similar with object-oriented programming, but you'd have method indirection overhead. A functor, in the mathematical sense, is a special kind of function on an algebra. It is a minimal function which maps an algebra to another algebra. "Minimality" is expressed by the functor laws. There are two ways to look at this. For example, lists are functors over some type. That is, given an algebra over a type 'a', you can generate a compatible algebra of lists containing things of type 'a'. (For example: the map that takes an element to a singleton list containing it: f(a) = [a]) Again, the notion of compatibility is expressed by the functor laws. 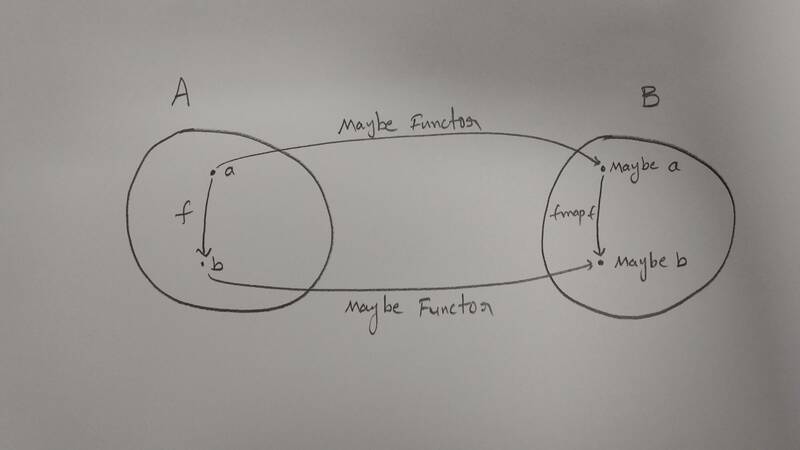 On the other hand, given a functor f "over" a type a, (that is, f a is the result of applying the functor f to the algebra of type a), and function from g: a -> b, we can compute a new functor F = (fmap g) which maps f a to f b. In short, fmap is the part of F that maps "functor parts" to "functor parts", and g is the part of the function that maps "algebra parts" to "algebra parts". It takes a function, a functor, and once complete, it IS a functor too. It might seem that different languages are using different notions of functors, but they're not. They're merely using functors over different algebras. OCamls has an algebra of modules, and functors over that algebra let you attach new declarations to a module in a "compatible" way. is isomorphic to the class of Ints. So F, as a value constructor, is a function that maps Int to F Int, an equivalent algebra. It is a functor. On the other hand, you don't get fmap for free here. That's what pattern matching is for. Functors are good for "attaching" things to elements of algebras, in an algebraically compatible way. There is a pretty good example in the O'Reilly OCaml book that's on Inria's website (which as of writing this is unfortunately down). I found a very similar example in this book used by caltech: Introduction to OCaml (pdf link). The relevant section is the chapter on functors (Page 139 in the book, page 149 in the PDF). In the book they have a functor called MakeSet which creates a data structure that consists of a list, and functions to add an element, determine if an element is in the list, and to find the element. The comparison function that is used to determine if it's in/not in the set has been parametrized (which is what makes MakeSet a functor instead of a module). They also have a module that implements the comparison function so that it does a case insensitive string compare. that creates a module for a set data structure that uses case insensitive comparisons. If you wanted to create a set that used case sensitive comparisons then you would just need to implement a new comparison module instead of a new data structure module. Tobu compared functors to templates in C++ which I think is quite apt. The best answer to that question is found in "Typeclassopedia" by Brent Yorgey. This issue of Monad Reader contain a precise definition of what a functor is as well as many definition of other concepts as well as a diagram. (Monoid, Applicative, Monad and other concept are explained and seen in relation to a functor). excerpt from Typeclassopedia for Functor: "A simple intuition is that a Functor represents a “container” of some sort, along with the ability to apply a function uniformly to every element in the container"
But really the whole typeclassopedia is a highly recommended reading that is surprisingly easy. In a way you can see the typeclass presented there as a parallel to design pattern in object in the sense that they give you a vocabulary for given behavior or capability. Here's an article on functors from a programming POV, followed up by more specifically how they surface in programming languages. The practical use of a functor is in a monad, and you can find many tutorials on monads if you look for that. So, basically, a functor in Haskell is something that can be mapped over. Another way to say it is that a functor is something which can be regarded as a container which can be asked to use a given function to transform the value it contains; thus, for lists, fmap coincides with map, for Maybe, fmap f (Just x) = Just (f x), fmap f Nothing = Nothing etc. I understand both ML-functors and Haskell-functors, but lack the insight to relate them together. What's the relationship between these two, in a category-theoretical sense? Note: I don't know ML, so please forgive and correct any related mistakes. Let's initially assume that we are all familiar with the definitions of 'category' and 'functor'. A compact answer would be that "Haskell-functors" are (endo-)functors F : Hask -> Hask while "ML-functors" are functors G : ML -> ML'. Here, Hask is the category formed by Haskell types and functions between them, and similarly ML and ML' are categories defined by ML structures. Note: There are some technical issues with making Hask a category, but there are ways around them. is a functor F: StructA -> StructB. "Functor is mapping of objects and morphisms that preserves composition and identity of a category." Lets define what is a category ? It's a bunch of objects! Draw a few dots (for now 2 dots, one is 'a' another is 'b') inside a circle and name that circle A(Category) for now. What does the category holds ? Composition between objects and Identity function for every object. So, we have to map the objects and preserve the composition after applying our Functor. Now, we have to define a functor which can map these objects and morphisms into another category 'B'. So, The category 'B' looks like this. Please draw another circle but this time with 'Maybe a' and 'Maybe b' instead of 'a' and 'b'. 'a' became 'Maybe a' and 'b' became 'Maybe b'. But the problem is we have to map the morphism from 'a' to 'b' as well. So, what are we doing here ? We are applying the function 'f' to 'x' which is of type 'a'. Special pattern matching of 'Nothing' comes from the definition of Functor Maybe. So, we mapped our objects [a, b] and morphisms [ f ] from category 'A' to category 'B'. Not to contradict the previous theoretical or mathematical answers, but a Functor is also an Object (in an Object-Oriented programming language) that has only one method and is effectively used as a function. An example is the Runnable interface in Java, which has only one method: run. The map method takes a function and returns a new array with each element being the result of the application of that function to the value at the same position in the original array. Using Functors let you apply functional techniques in an OO language. Of course, some OO languages also have support for functions directly, so this isn't required. In functional programming, a functor is essentially a construction of lifting ordinary unary functions (i.e. those with one argument) to functions between variables of new types. It is much easier to write and maintain simple functions between plain objects and use functors to lift them, then to manually write functions between complicated container objects. Further advantage is to write plain functions only once and then re-use them via different functors. Examples of functors include arrays, "maybe" and "either" functors, futures (see e.g. https://github.com/Avaq/Fluture), and many others. A Functor in Category Theory is a map between two categories respecting composition of their morphisms. In a Computer Language, the main Category of interest is the one whose objects are types (certain sets of values), and whose morphisms are functions f:a->b from one type a to another type b. Here a = String represents the set of all strings and b = Number the set of all numbers. In that sense, both a and b represent objects in the Set Category (which is closely related to the category of types, with the difference being inessential here). In the Set Category, morphisms between two sets are precisely all functions from the first set into the second. So our length function f here is a morphism from the set of strings into the set of numbers. As we only consider the set category, the relevant Functors from it into itself are maps sending objects to objects and morphisms to morphisms, that satisfy certain algebraic laws. Array can mean many things, but only one thing is a Functor -- the type construct, mapping a type a into the type [a] of all arrays of type a. For instance, the Array functor maps the type String into the type [String] (the set of all arrays of strings of arbitrary length), and set type Number into the corresponding type [Number] (the set of all arrays of numbers). which sends a value into the 1-element array with that value as single entry. That function is not a part of the Array Functor! From the point of view of this functor, pure is just a function like any other, nothing special. Here arr is any array of arbitrary length with values of type a, and arr.map(f) is the array of the same length with values of type b, whose entries are results of applying f to the entries of arr. To make it a functor, the mathematical laws of mapping identity to identity and compositions to compositions must hold, which are easy to check in this Array example. KISS: A functor is an object that has a map method. In practice, functor means an object that implements the call operator in C++. In ocaml I think functor refers to something that takes a module as input and output another module. Put simply, a functor, or function object, is a class object that can be called just like a function. foo(); //result: Hello, World! I'm a function! bar(); //result: Hello, World! I'm a functor! What makes these so great is that you can keep state in the class - imagine if you wanted to ask a function how many times it has been called. There's no way to do this in a neat, encapsulated way. With a function object, it's just like any other class: you'd have some instance variable that you increment in operator () and some method to inspect that variable, and everything's neat as you please. Functor is not specifically related to functional programming. It's just a "pointer" to a function or some kind of object, that can be called as it would be a function. Not the answer you're looking for? Browse other questions tagged functional-programming ocaml functor or ask your own question. How are functors in Haskell and OCaml similar? How to compare string in OCaml? What is a Functor in Python? What would be a good example of an endofunctor that is not the identity functor? is apply method in companion object functor in scala?